Conventions and tropes affect the creation of all forms of media, from literature to games. Following norms can be helpful for guiding users' experiences, but norms can also get in the way. Max asks a new year's resolution from designers: whenever your design conforms to a trope, make sure you are doing it intentionally, and not by default. Conventions and tropes in games (and in other forms of user consumed media) are a force to be reckoned with. On the one hand, conforming to these norms allows new games to be learned and understood easier by their players. On the other hand, following these conventions can stifle creativity and innovation in a designer's games. So what do we do? Unfortunately, this is a question with no easy answer, and people have been struggling with it in every field as long as mass media has existed. Conventions exist at several levels in game design. They can exist at the extremely micro level, like individual graphic design choices. They can exist at a medium level, for example in the way the mechanics function. Conventions also exist at the highest level: the genres to which the game conforms (or doesn't). The value of the card is printed both in the center, the upper right, and the upper left. The cost, however, is printed in the lower left. 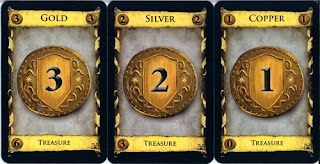 It doesn't take too long to learn the distinction, but by having the cost printed in the bottom left and another number printed in the upper right, Dominion adds confusion to the learning process, because players are so used to the Magic conventions. It might have been a good idea in this case to conform to the Magic conventions (or at least to keep them in mind when laying out the cards). Although I believe that some conventions (like the one above) can actually achieve their convention status by actually being a best practice in design (or at least, better than the alternatives), most conventions exist in areas where there can be no best practice can exist (for example, there can be no "best" genre). When a convention is asserted to fall into this camp it's often by players or designers who are blinded by thinking the way things are now are the way things must be, which can lead to stagnation in design. This is particularly poignant when it comes to mechanical and genre-level conventions. 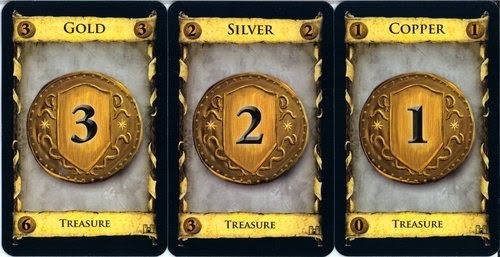 For example, if designers working on cooperative games only followed the genre conventions for currently popular cooperative games like Pandemic and Arkham Horror, we would end up with games where players are fighting the system towards a climax where either the system destroys them and they lose, or they overpower the system and win. 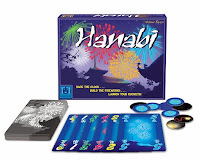 If this were the case, we would never see innovative games like 2013's Spiel Des Jahres winner Hanabi, where players work together not to achieve a pass/fail with against a system with ever-increasing difficulty, but instead fight the system to beat their own previous records in score. While beating one's own score is a popular motivation in other forms of games (cross country and arcade games are two examples), this motivation has been underutilized in board games until now because designers have conformed to cooperative board game conventions. This is, of course, a catch 22 - designers don't defy conventions until a different designer begins to establish a new convention. I've been enjoying Hanabi immensely. It breaks some new ground in design, but unfortunately it's not for everyone. This all leads up to one question I continually ponder: how much does knowing the basics of a field hurt your attempts to innovate in that field? Famous innovators (Picasso for one) have stated that before you can innovate you have to have mastered the state of the art. I don't think this is true; I think many break throughs from left field come from people who don't understand the tropes and conventions. The trick is, without understanding the norms I think those people likely won't be able to replicate their innovation. When you understand the tropes, you can play with those since know what norms to twist and what conventions to violate. The challenge is not getting sucked into thinking that those tropes are the way things are and must be. Being able to do this is much more easily said than done. You have to teach yourself to come at design with fresh eyes, no matter how well you understand the state of the art. Of course, Hanabi also breaks the convention that says you hold a hand of cards so that you can see them and the other players can't.